Bahrain Defense Force (BDF) Commander-in-Chief Field Marshal Sheikh Khalifa bin Ahmed Al Khalifa (photo), received the Commander of the French Forces stationed in the UAE and those deployed in the Indian Ocean, Rear admiral Didier Maleterre, and his delegation. 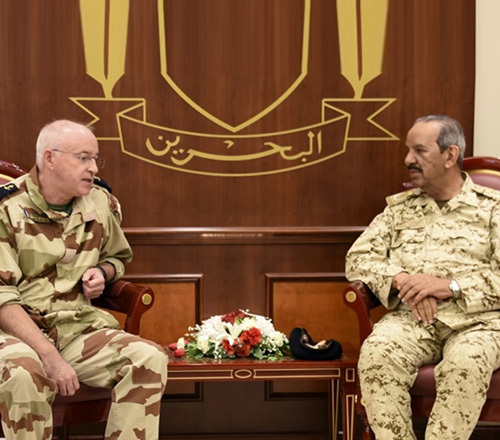 The Commander-in-Chief reviewed relations between Bahrain and France and means of enhancing them at various levels, especially those related to military coordination and defense cooperation, Bahrain News Agency (BNA) reported. For his part, Bahrain’s Royal Guard Commander Major General His Highness Sheikh Nasser bin Hamad Al Khalifa received at the Al-Rawdha Camp, in the presence of the Royal Guard Special Force Commander, Lieutenant-Colonel HH Sheikh Khalid bin Hamad Al Khalifa, the Commander of the visiting French Rear admiral Didier Maleterre, and his accompanying delegation. The Royal Guard Commander discussed with the visiting delegation areas of military cooperation between the two countries, and ways to enhance them in the future. Rear Admiral Didier Malterre expressed thanks to the Royal Guard Commander and the Royal Guard Special Force Commander for their role in bolstering relations between the two sides. Sheikh Nasser also received in his office at Rawdha Camp the US Central Command Special Operations Commander Rear Admiral Wyman Howard and his accompanying delegation. The meeting was held in the presence of Commander of the Royal Guard Special Force Lieutenant Colonel His Highness Sheikh Khalid bin Hamad Al Khalifa. The Royal Guard Commander welcomed the US Central Command Special Operations Commander and his accompanying delegation and discussed with them ways of boosting military cooperation between both countries. He praised strong historical ties binding the Kingdom of Bahrain and the USA in various fields.